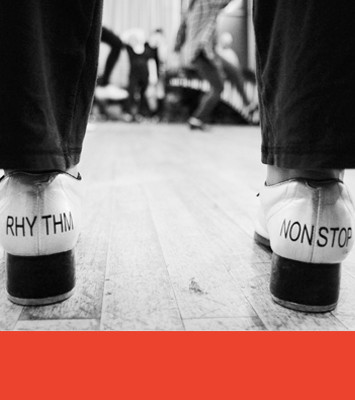 “Tap at Illinois”–a semester-long celebration of tap dancing by Krannert Center for the Performing Arts, Dance at Illinois, and Lyric Theatre @ Illinois—kicks off January 16 with a screening of the film American Tap. The screening is being presented as part of Dance at Illinois’ Flatlands Dance Film Festival. American Tap looks at tap dancing as an American art form, tracing it from its origins through its heyday in the Big Band era to its current resurgence. It features the most iconic tap dancers throughout history, including Bill “Bojangles” Robinson, The Copasetics, Gregory Hines, Savion Glover, and Michelle Dorrance. Both Glover and Dorrance will perform at Krannert Center this semester. The movie will be shown on Wednesday, January 16, at 7pm at The Art Theater, 126 W. Church St., Champaign. The screening is free and open to the public. “I think tap dance holds a nostalgic value for many people who recognize it as America’s most popular art form during the golden age of movie musicals and vaudeville performances. It also has become linked with the youth culture of hip hop because of Savion Glover’s popularity over the last 30 years,” said Rebecca Ferrell, the director of the Flatlands Dance Film Festival, and the director of public relations and engagement and a lecturer for Dance at Illinois. Glover will perform January 26 at Krannert Center with acclaimed jazz drummer Marcus Gilmore. “Savion Glover continues to reign as one of the greatest tap dancers of all time. After a prodigious start and a Broadway debut at age 10, Glover helped to bring tap back into popular culture through appearances on Sesame Street, his two Tony Award-winning smash hits Bring in ‘Da Noise, Bring in ‘Da Funk and Shuffle Along, and choreography for the animated film Happy Feet,” said Krannert Center’s Bridget Lee-Calfas. Michelle Dorrance, a former member of STOMP and Savion’s company Ti Dii, is the founder and artistic director of Dorrance Dance. She and her company will perform three pieces on Thursday, March 14: Myelination, an ensemble piece with original live music; the Bessie Award-winning Three to One; and Jungle Blues, with a score by Branford Marsalis. “Michelle Dorrance is the first tap dancer to be awarded a MacArthur Fellowship and has quickly become one of the most sought-after choreographers of her generation. Her imaginative style upholds tap traditions while propelling the form forward rhythmically and technically with visually enticing performances,” said Lee-Calfas. In addition to these Marquee series offerings at Krannert Center, Dance at Illinois will present Studiodance I, running for six performances from February 28 to March 2. In one of the two distinct programs, Master of Fine Arts candidate and tap dancer-choreographer Charlie Maybee will present his thesis, The Promise of Stormy Weather, featuring four alumni of Dance at Illinois. In April, Lyric Theatre @ Illinois will present George Gershwin and Ira Gershwin’s Tony Award-winning musical Crazy for You —featuring such memorable Gershwin tunes as I Got Rhythm, They Can’t Take That Away from Me, Embraceable You, and Someone to Watch Over Me. Crazy for You, with choreography by Maybee, will be performed April 25-28.